FFRF does not condone violating the Constitution by erecting a Ten Commandments monument on the Arkansas Capitol grounds. Nor do we condone breaking the law to remove such a display. Early today a mentally ill Christian rammed his car into the controversial Ten Commandments monument installed Tuesday on the Arkansas State Capitol grounds. Michael Tate Reed, 32, of Van Buren, who is described as a Christian with mental illness who was "off his medication," has been arrested and charged with defacing objects of public interest, criminal trespass and criminal mischief. Area news outlets report this is not the first time Reed has destroyed a monument. In 2014, Reed was arrested after allegedly destroying the Ten Commandments monument on the Oklahoma State Capitol grounds. Ultimately, the ACLU prevailed in getting that Ten Commandments removed by court order. This broken Ten Commandments monument also will be challenged, with the ACLU advising it's preparing a lawsuit. Yes, the monument was struck down in a criminal act. More importantly it will be struck down as unconstitutional by a court of law. There is no need to resort to criminal behavior to uphold the Constitution. Obviously, the motivation of this disturbed individual is unknown (and perhaps even unknown to him), but is unlikely to be about upholding the separation of religion and government. Whatever his motivation: We are a nation governed by the rule of law. That not only means vandalism will not be tolerated, but it also means that we take our disputes to court. 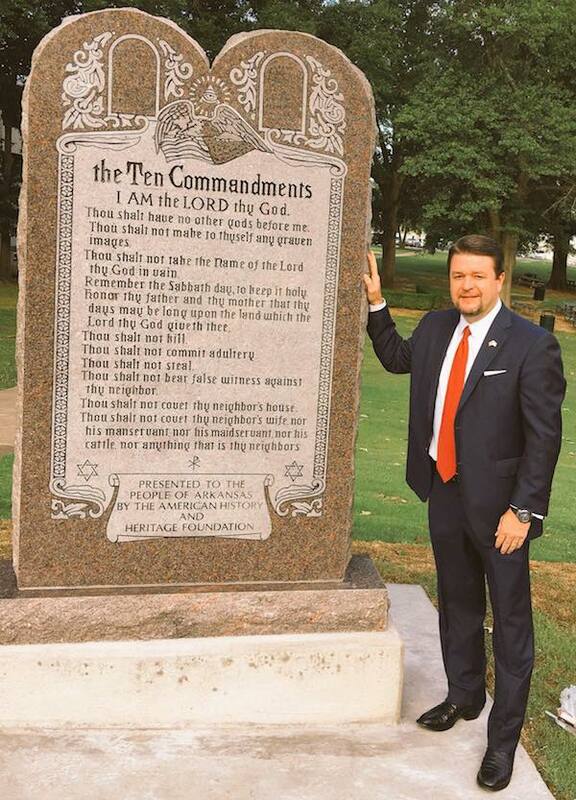 We are confident the facts in the Arkansas placement of a Ten Commandments monument will result in lawful removal of the bible edicts from the seat of state government.